This mod is now being maintained by @linuxgurugamer at the new thread linked below, please head there for the latest downloads and information! Attention! @linuxgurugamer has graciously taken over development of this mod. As part of that, MagiCore is now being released separately and must be downloaded separately. Kerbal Construction Time is a plugin which, at its core, is designed to make vessels take time to build rather than being able to constantly launch new vessels one after another. This core feature is expanded upon to create a larger system for managing your space center. Build your vessels, upgrade your facilities, research new technologies, and make decisions where you never had to before (Do I upgrade the VAB further or start upgrading the SPH? Do I want to build single vessels quickly, or multiple vessels at once? Is getting new tech faster worth building ships slower? Do I use these old parts to be ready for the transfer window, or do I use new parts with better stats?) When combined with other realism based addons, especially life support addons, the experience is even better. No longer can you send out a rescue mission without consequence, making planning that much more important. Vessels take time to build, dependent on vessel complexity (cost), how many times the parts have been used before, if any of the parts are in your inventory, and your Build Rates. Unlock multiple build rates to build multiple vessels at once (2 rates = 2 vessels being built simultaneously), or just upgrade your first build rate to be lightning fast. Tech nodes take time to research. No more instant part unlocks. Earn or purchase upgrades which you can spend to build ships faster (or more at once), research technology quicker, or earn science for building ships. KSC building upgrades also require time to complete. After each rocket launch the launchpad must be reconditioned and repaired before the next launch can occur, based on the vessel's mass. Additionally, rockets must be rolled out to the launchpad from the VAB. Highly customizable. Don't want tech unlocks to take time? Disable it. Want builds to take longer or for inventory parts to have a bigger effect? Easily changed. In fact, nearly every formula used by KCT can be edited in-game or through a config file! Automatic creation of Kerbal Alarm Clock alarms for the next ship/tech to finish. An awesome icon made by diomedea, who I feel bad about not crediting anywhere for the longest time for some reason. Multiple launchpads! (gfycat link) Build and upgrade several launchpads so you can launch your rescue craft right away! Don't get stuck waiting for reconditioning to finish. ScrapYard - Adds a part inventory that can greatly reduce build times. StageRecovery - Recover dropped stages to help reduce build times when used with ScrapYard. Crew R&R - Adds time elements to crew, whereas KCT only acts on vessels and KSC. Oh Scrap! - A part failure mod built upon ScrapYard. A life support or part failure mod. These types of mods add additional challenges that mesh well with the build time limitations of KCT. You cannot launch with kerbals in command chairs, so if you assign a KIS inventory to that kerbal in the editor then it definitely won't be there when you launch. If you're in need of help, don't forget the getting started guide, originally written by guto8797 with updates by me (last updated for v1.2.1). 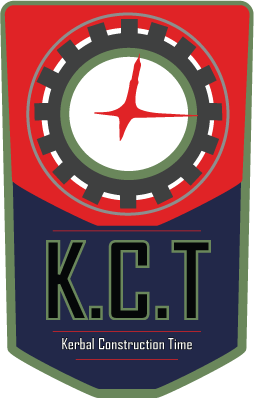 A fairly in-depth set of documentation for KCT covering everything from building a vessel to the details of every option in the Settings menu. It is written somewhat satirically, but contains a treasure trove of information and is also included with each release. License is GPL v3, source is on GitHub. I permit the use of KCT in mod packs or other forms of distribution, but ask that I be notified. I would prefer there to not be derivatives made unless I give permission directly or I am completely out of contact for over a month. While none of these are requirements of the license, it is respectful that you honor these requests (and I'll be way more willing to provide help if you do). Check out OverloadUT's (KSP-TV livestreamer) epic story of rescue, due in part to KCT here. now on year 8 of my super-career game. [-snip-] my space program has gone from mercury to apollo and beyond. the time span feels realistic, think how much we accomplished in a decade? and now, for the first time... my game has a sense of HISTORY. there have been failures (thanks dang it!) and engineering screw ups (all me). famous astronauts (thanks final frontier) An entire interplanetary cruiser turned out to be a horrible design, and barely got the crew back alive (thanks TAC life support). but most of all, thanks to KCT, there is that feeling of history. The game is telling a story now, and that story will be different for everyone. A review by Scott Manley. It doesn't quite catch the fun parts of KCT, but does a good job of showing off some of the basic features. A short (~12 minutes) video by me (magico13) explaining some of the features at the time of release, without going too much into details. - Removed part inventory, optionally use ScrapYard mod instead. - Build list and editor UI are now clamped to the screen such that the center of the window cannot go off-screen. - Support for CrewRandR added. Crew that are grounded are not allowed to be on flights. - New method of handling KSC upgrades by overriding the upgrade button on the UI. Less prone to errors since it doesn't have to downgrade buildings. - Round level checks when getting building levels. Fixes various issues, especially with Custom Barn Kit. - Fixed issues with support for Editor Time modlet. - Fixed bug where build rate 2 was showing up when it shouldn't be when changing presets. - Refresh parts when duplicating vessels (ScrapYard specific). Fixes issue where inventory parts were being duplicated. - Integrate with the Making History Expansion's multiple launchsite feature. Can choose launchsite from BL+ window as before or from editor when building. - Moved settings into PluginData folder. - Some trickery to make sure the editor window doesn't get shrunk, as is happening for some as yet to be determined reason. - Various refactoring and removal of unused code to improve stability, maintainability, and performance. - Multiple launchpads added. Build additional pads to launch ships more often. Each pad has its own rollout and reconditioning timers, along with upgrade and damage states. Can be renamed as well. - All time input fields now support using y, d, h, m, and s for years, days, hours, minutes, and seconds. Can mix and match as needed. - You are now warned when a ship contains invalid parts instead of the game breaking. You have the option to ignore it for now or delete the vessels. If you delete them, you get the funds back. All the offending ships and parts are logged to a file in the save folder. - Improved KSCSwitcher support. Now properly sets the default KSC, each KSC can have its own launchpads, and upgrade points can be shared between them. - Rollout and Launch buttons now colored green if pad is OK, yellow if it is being reconditioned, and red if it is destroyed. - Warp To functionality improved. Now much, much faster to warp down. - Tech Node Research cancellation must now be confirmed. - Delay for moving a vessel to orbit in simulations is now configurable. - Simulations should (hopefully) no longer mess up orbits when they time out and you purchase more time. - Added several "Crew Variables" to several formulas. Check the Wiki page on Variables for more info. - The launchpad changes are potentially save breaking if it doesn't update to the new system correctly. That bug should be fixed, however. - KCT now "upgrades" buildings A LOT. Any mod listening to the OnKSCFacilityUpgrading or OnKSCFacilityUpgraded events will likely be INCOMPATIBLE. Please notify me if you find any such mods and I'll see what I can do. - New artwork thanks to a friend of mine! - Switched to using Planetarium.fetch.Home rather than searching for "Kerbin" or "Earth"
- When pressing the launch button in the editor, the launch/sim window now appears at the mouse as a "drop-down"-like menu. To switch back, change WindowMode to 0 in the KCT_Config.txt file. WARNING: This update is semi-save breaking. If you're using custom configs you MUST update them to the new Presets system. - Presets! Easily create, share, and switch between different settings. Mod authors can include Presets in their releases (see RP-0), players can save their most commonly used configurations, and config modders can create any number of new gameplay styles and easily share them. - Numerous new settings and formulas. - Clear out the part inventory in exchange for upgrade points. - Kerbal Konstructs support. Different launch sites now have their own rollout and reconditioning queues. - Rollout times are displayed when hovering over the rollout button. - Simulations can now be performed without recovering craft at the launch site and even if the vessel is too big for the launch site. - You can now build vessels that are too big to launch, but can't launch them until you upgrade the facilities. - Kinda crappy half-finished attempt to disable RemoteTech during simulations. Doesn't work properly if there's an antenna on the craft. I'll get this fixed for a hotfix later on. - Removed built in update checker. With KSP-AVC, CKAN, Kerbal Stuff and others, it isn't needed anymore. - Updated StageRecovery, Toolbar, and KAC wrappers. - Windows that are meant to be centered are going to be centered, $DEITY damnit! - The Most Requested Feature: Recovering directly to storage. Be warned that it likely has bugs, especially with mod parts. Requires manual refuelling of ships. - KSC Upgrades now have time requirements associated with them. - Several new formulae have been exposed for editing, including the entire BP calculation formula. - Rush builds 10% by spending 20% of the total vessel cost. - Simulation time limit selection now persists per save. Defaults to infinite time if "free simulations" is active. - Added a popup that occurs when KCT doesn't load save data properly. - Fixed issues with editing a ship past VAB/launchpad limits. - Fixed several issues with upgrade point purchases/resetting. - Fix loading a save after a crash during a simulation. - "icons" folder renamed to "Icons"
- Check the GitHub commit log for more. This took a long time. - Made it so you don't have to be able to afford the vessel to simulate it. - Fixed issue where you couldn't simulate in orbit with build times disabled. - Made build list window not randomly appear when build times disabled. - Hopefully fixed issue that nerdextreme on reddit had where something weird was happening with the toolbar. - RELEASE!!!!!!! AFTER 7 MONTHS! - Purchasing upgrades starts at 4 science or 16000 funds and doubles each time until 512 science or 1024000 funds, respectively. - Saved position and visibility of the Build List, Editor, and Time Left windows. - Made it so parts can be pulled from the inventory while editing. - Can purchase additional time at the ends of simulations at an increasing rate. - Overrode the Launch button so it's not disabled anymore. - Fix for calculating resource mass when the resource reference is null. - Fix for simulations thinking the vessel cost twice as much as it actually does. - Fixed a bug where runway items could trigger launchpad reconditioning. - Bugfix so that default crews would be assigned after recovering an existing flight on launch. - Added LaunchPad reconditioning. While it's active you can't launch. - Moved several settings from Global to Game and added a menu for setting the default settings. - Added "Warp To" setting to all build lists and tech list. Pressing will warp time to that item's completion. If Stop Warp On Complete is active, then warp will still stop upon any item's completion. - Auto-updater set to not check for updates until after the user has gotten a chance to disable them. - Editing of vessels is re-enabled. - Recovery messages or all messages can be disabled in the settings. - The current state of the auto-updater is included in the first run dialog. - Changed Tech Unlock time notification to use appropriate time units. - Added warning message to first run window about time pausing when hovering over Build List. - Added support for StageRecovery API. If SR is installed, KCT will let it handle recovery code and only receives the part list. - Fixed a bug with recovery code that would cause a failure if the same part was used multiple times on the recovered craft. - Added mouseover lock to BL+ window. General lock to launchpad clearing window. - Disabled recovery messages when DebRefund or StageRecovery are installed. - Made the events register even if KCT is disabled for a save. This way funds can still be recovered. - Altered update checker to allow checking for absolute latest version, or just the latest version for the specific KSP version. - Dropped stages are "recovered" at 75% of what they normally would because of distance from KSC with parachutes. 100% of normal if a probe core is attached. - Updated to newest Real Chutes. - Added Locks when mousing over the editor window or the build list window. BL window lock prevents entering buildings but pauses game! - Basic support for the stock toolbar. The icon goes there and when ships complete or stages are recovered you are notified through the message system. - Integration with DebRefund. If it is installed, all funds recovery is handled by it. Otherwise, KCT's funds recovery is used. - Known Issues: Editing is currently broken, hovering over the build list pauses the game, you can't simulate a vessel that costs more than you have. - Automatic update check (specific to KSP version, so 0.23.5 right now. 0.24 updates won't be displayed). Default is based on user's progress tracking setting. - Estimated times for completion in the build list are now based on the highest build rate. - The build list, settings window, and part inventory now use a toolbar instead of a bunch of buttons. This looks a lot nicer, but is a bit bigger. - Fixed several issues with the crew selection GUIs, stopped autohiring and setting a default crew (for now), added button to hire the next random Kerbal when no more are available. - Fixed bug with right-clicking windows causing them to vanish until game restart. - Can reset spent upgrades (costs 2 upgrades, non-permanent loss). - Build times can be disabled for a "simulation only" mode. Current ships/tech will continue progressing, new ones will be instant. Toolbar button opens the settings or simulation configuration window (or nothing) depending on scene. - Fixed bugs with starting a new game after loading an old one and with loading a game where the mod is disabled after loading one where it is enabled. - Getting the ship name is better now: doesn't require a save before building to get the correct name. - Can change the build rate used for time estimates in the editor (want to see how long it will take at a rate of 1, 1.5, 9001?). Defaults to highest rate. - Can opt out of using inventory parts for a build. - Temporarily removed the view button since it doesn't work yet anyway. - Added a small window to the build list (access by pressing the "*") for advanced functions (scrap ship, view in editor (not implemented yet), rename, duplicate). - Science can now be earned for building ships (representing the hands on experience having some value). It is a separate rate in the R&D tab of the Upgrades window. Each point put in increases the rate by 0.5 science per 86400 build points the ship is worth (0.5 science per day at 1BP/s). - Fixed/changed how parts are tracked (For some reason I was tracking every single instance of a part on a ship, instead of only once per ship like I thought I was.) The part tracker won't increase as quickly now. - Fixed a bug with launching from the Tracking Station not removing the ship from storage. - Adding settings menu so you can change settings in-game (time settings/enable or disable for a save). Accessible through build list in Space Center. - Part inventory is sorted by category now. - Finer control of build list order using up/down arrows. Build List GUI needs a bit of work, so it doesn't look all that stellar. - Simulations now create a backup save which is loaded whenever the flight is finished. This fixes several issues with the current method, especially when the game crashes during a simulation. - Code is now on github! - Fixed booster recovery bug where parts weren't being recovered when they said they were. - Implemented CompatibilityChecker. Only gives warning if used with incompatible version. - Implemented Mission Controller Extended compatibility. On revert, you are given your money back, 100%. - Fixed an issue with vessels not being removed from storage on launch. - RealChute support is now done using reflection and so only ONE version of the mod is needed. It is now "universal" for both stock and RealChute. - Enabled the Build List window in the tracking station. The default GUI parameters are weird there, so it looks pretty different. - Fixed bug with reverting to launch not giving you crew. - The toolbar is now optional, but still included and is highly recommended. - Added optional support for RealChutes, but requires two separate versions now. - Added (and in fact, now require) Blizzy's Toolbar support. Icon credit goes to diomedea. The icon will flash when a vessel is completed! - THE BUILD LIST! Vessels are added to a build list (one for VAB, one for SPH) and built sequentially. The order can be changed with the TOP button and the vessel can be cancelled with the X button. Vessels are moved to storage after completion. - Vessel storage. One for VAB and one for SPH. Can launch craft or scrap them for their parts. Currently unlimited size, same as Build List, but will change later. - Simulations are now based on game time. Currently set to 2 game hours. They don't auto-revert except in the case of crashes. Periapsis/apoapsis don't matter. - Boosters are automatically recovered if they have enough parachutes to drop the terminal velocity below 10 m/s. Check the Alt-F2 log to see if they get recovered on unload. - Possibly fixed issue with time warp getting stuck on when the total build time is only an hour or two (may still overshoot a bit though). Pre-Release 1 - initial release. Woohoo! Release! This is one of the best realism mods out there. Really does make the whole space program have more 'weight' and substance. Could be the update checker freezing up. Try going into the settings window first and disabling that. If it is the update checker then it might freeze up for a bit if it can't connect to the server, but should timeout and work normally after a minute or so. No one has ever reported something like that before, so that's a new one for me. OooOoOoO I love being the spokesperson!!! Just got the message about the update, wooohoooo. Everything has been working very smoothly. Can't imagine playing without KCT anymore. Awesome, congrats on the release! Been using it since 0.24 and I love it. omg there are so many options. Must...resist...desire..to change things so deep into my career game. Thanks for making everything so crazy customizable I could see myself running a hyper-realistic game next with epic timescales. Just curious, I didn't see it mentioned here, but in your vid ^ up there, KCT was using the stock infobar, does this still work with toolbar mod? And does that crew selection screen have sliders to let you modify your kerbals? Does that work!? Location: Customizing instead of playing. Is this compatible with Mission Controller Extended? From what I've seen in both videos it seems that it won't be a problem. The only things that I'm wondering about is MCE's 'difficulty' modifiers since it changes part cost multipliers and it's added revert button. Thanks for making such an awesome, in-depth mod! "Each rocket launch damages the launchpad, causing it to have to be reconditioned (based on vessel mass at launch)." "After each rocket launch the launchpad must be reconditioned and repaired before the next launch can occur, based on the vessel's mass. Does work reasearch of custom tech nodes? For example NearFuture Tech, KSPI Lite... and many others. Whelp, I'll just have to keep editing my Kerbs in the persistence file then. I tried this out and it seems to have solved the problem. Weird, because other mods were able to check their version fine. Oh well, working fine now! I have a problem: after the first launch after loading from the main menu the launch button stops working for KCT, so I go directly to the launchpad without having to wait for construction. I am using the 64 bit Windows Version of KSP. To fix this I have to got back to the main menu and load my career game again, quicksaving/loading does not fix it. Anyone else got this problem? On my current career game, I've set myself some strict limits on research upgrades, I can only upgrade my research speed, if I have a staffed lab. So I built so labs, got them staffed, and upgraded my research speed a bit, but I thought I made a mistake, so I exited my game, started a new game, and counted how many points it took to upgrade my research to its current speed. I realized I was right, so exited and deleted that game, went back into my main save, and for some reason KCT instantly completed one of my research projects that still had around 100 days. Its only minorly annoying, I'll just wait 100 days or so to use any of the unlocked parts, so it isn't cheaty, but its going to get progressively worse if KCT continues to do this for some reason. I was using the new release version, and had upgraded from the dev version, but it was about 5 launches and one trip to Mun after I upgraded that this happened. How do you simulate vessels now? I click launch in the VAB, select simulate, and it gives options to choose starting body, simulation time and a tickbox to select for orbit start, but no way to actually start the simulation. I have enough funds to simulate, but not build, the rocket. YES! Hello magico, glad to see this FINALLY on the addon releases page! Very nice, and the Initial page is very neat too!... but...but...but...where iz my names? Is this compatible with Mission Controller Extended? It uses the part costs after they've been modified by other mods (which is actually a recent change to support TweakScale) so increasing the costs with MCE's difficulty settings will also increase the time it takes for ships to build. You can (mostly) balance that out by setting the Overall Multiplier to 1/(MCE difficulty multiplier) (so if it's x2, set the Overall Multiplier to 0.5), or you can use the longer build times. It should, assuming they're using tech nodes like the stock game does (pretty sure they do). If they've added parts to existing stock nodes it will definitely work fine. There are some other mods that let you modify kerbal stats in game, I believe Ship Manifest does and there's one I saw recently developed that ONLY does modification of kerbals. It was likely an issue on my end since the update checker uses my personal Linux server (sitting here on the desk behind my right monitor). Sometimes my network decides not to make a connection, but it seems pretty rare. I can't seem to make this happen on my end, but someone else reported it too. You could try going into the settings and disabling "Override Launch Button". What that will do is make it so you can't use the launch button at all but instead have to press "Build" or "Simulate" on the KCT Editor window. If the launch button becomes available at some point, then something is very seriously wrong. A log file from after this happened would probably help, since the only way that could happen (or at least the only way I can think of) is if Start() didn't finish, which is very very bad. Or some other mod is doing something with the Launch Button too and we're competing (in which case I want to know which mod it is so I can work something out with them). I couldn't get that to happen for me, but I did notice an error being registered by TreeLoader which maybe caused it to happen. If you see it again, please let me know. The Tech List and the Upgrades should all be reset to 0 when you go to the main menu to avoid anything being transferred from one save to another. Unfortunately you have to have funds for both the simulation and the vessel. The stock game won't let me launch the rocket otherwise (without writing an entirely new function to do the launch, which is non-trivial). I'm planning on trying to find a way around this (and have an idea in mind). Basically just giving the funds of the rocket to the user when they press Simulate and taking it back at the end. The issue is if they Alt-F4 out of the game during the simulation they'd have the extra funds when they came back, so that means I have to store the amount to take in the persistence file. Yes it works perfectly with unlocking nodes on custom trees. Does anyone know what multiplier i should give this to line up construction times with EPL? It seems weird right now that i can construct a ship faster off world than at home with all the resources of kerbal kind behind me. That is really hard to say because EPL construction times vary based on the productivity of the base attached to the launchpad / runway that you are using to build the vessel. Also with KCT the time it takes depends on the production rate of the line at the facility being used. A production like with 1BP/s will finish in half the time for the same ship on one only upgraded to .5BP/s. Much more is in the works than just the multiplier. Yay! Thank yooou for answering my tantrum, but its the first time I have my name somewhere! And what the hell is wrong with KSC forum writting? Like JeffreyCor said, there's likely not going to be a catch all configuration to get times that correspond closely to Extraplanetary Launchpads because the two systems work very differently. My suggestion would be to determine how long it takes to build an appreciably sized ship in EL with a large (10? I don't know what a good number would be. I've never used EL) crew of really smart kerbals, then make that same ship build 1.5 (or 2x or more) times FASTER with KCT (since you'd conceivably have a lot of smart kerbals available). Note that after about 4 builds with the same parts, the total build time will be half that of the first build, so you may want to make it just a little faster (like 1.1x) at first (since it will quickly speed up). I like it) Cool mod. Do you have any plans to do something like mass production of launch vehicles? For example - I need to launch several parts of MIR station and I give an order to prepare 5 identical LV (based on subassemblies e.g.). Then I just mount modules on LV and it takes less time than the full assembly.